Self-service technologies are a key aspect of business for today’s most successful banks. 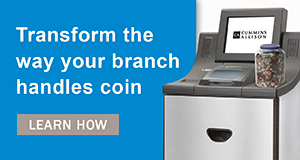 Research shows that institutions that effectively employ this technology and build strategies focused on customer value find significant cost savings and increased customer loyalty and satisfaction.1 While ATMs may be the main players in the self-service space, another service that should not be overlooked is the self-service coin machine. While many have predicted the closing of America’s branches, customers are still choosing in-person banking experiences. Rather than becoming obsolete, they are taking on a new meaning creating opportunities for greater profits. While the majority of today’s customers prefer interacting with their institutions online, nearly half of customers still visit their bank branch more than 10 times per year.3 Branches are transforming in an effort to remain relevant and provide fulfilling customer experiences in both the digital and physical spaces. A self-service coin counter located in a branch offers an additional reason for customers to visit when it comes time to redeem coins. According to an Accenture report, banks with high numbers of customers engaged via self-service are often among those banks with the highest rates of loyalty and customer satisfaction.